Mercurii, 7 die Aprilis; Anno 11 Georgii IV ti Regis, 1830. Ringmer and Hurst Green Roads Bill, reported. Petition against New River Company Bill. Petitions in favour of Glasgow Royalty Extension Bill. Petition against Perth Navigation Bill. Petition against Tay Ferries Bill. Minutes respecting London and Birmingham Junction Canal Petitions, ordered; No. 260. Petition against Hull and Beverley Road Bill. Acle and Yarmouth Road Bill, passed. Limerick and Charleville Road Bill, reported. Petitions against throwing open Trade in Beer. Petition against Duty on Scottish Spirits. Returns from King's Bench and Fleet Prisons, ordered. Grazier's Steam Company (Ireland) Bill, presented. Account of Poor Returns ordered. Petition against Assimilation of Stamp Duties. Petitions against Increase of Duty on Spirits. Bolton and Blackburn Roads Bill. Edenfield and Little Bolton Roads Bill. Congleton and Buxton Road Bill. Smugglers Families Maintenance Bill, with Amendments. The Lords request the Attendance of Members. House will send an Answer. Amendments to Smugglers Families Maintenance Bill, agreed to. Amendments to County Palatine of Durham Bill, agreed to. Accounts of Post Office Packets, ordered. Committee on Library of House of Commons, appointed. Four per Cent. Annuities Bill, passed. Committee on Stamp Duties Acts. Committee on Ecclesiastical Leases (Ireland) Bill; No. 261. Committee on Bogs Drainage (Ireland) Bill; No. 262. Committee on East Retford Witnesses Bill. Malt Duties Bill, presented. No. 263. MR. Burrell reported from the Committee on the Bill for more effectually repairing and improving the Roads from Lewes, through Offham, to Witch Cross, from the Cliffe near Lewes, through Uckfield, to Witch Cross, and from the said Cliffe through Ringmer, Heathfield and Burwash, to Hurst Green, all in the County of Sussex; That the Standing Orders relative to Turnpike Bills, had been complied with; and that they had examined the allegations of the Bill, and found the same to be true; and had gone through the Bill, and made several Amendments thereunto; and the Amendments were read, and agreed to by the House. 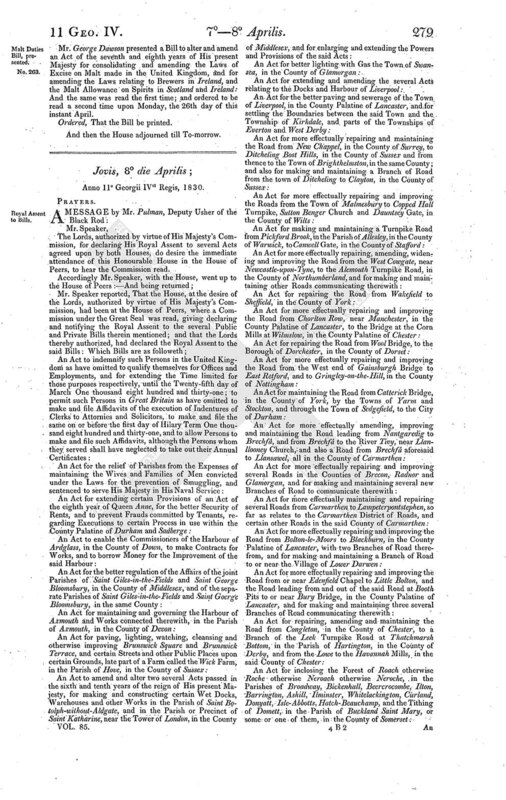 A Petition of Osgood Hanbury, of Lombard-street, in the city of London, banker, (committee of the estate of John Craven, of Stamford-hill, in the parish of Saint John Hackney, in the county of Middlesex, Esquire, a lunatic), was presented, and read; taking notice of the Bill to amend an Act of the twelfth year of King George the Second for improving the Navigation of the River Lea, and for enabling the Governor and Company of The New River the better to supply the Cities of London and Westminster, and the Liberties and Suburbs thereof, with good and wholesome Water; and praying, That he may be heard by himself, his counsel or agent against certain parts thereof. Ordered, That the said Petition be referred to the Committee on the Bill; and that the Petitioner be heard by himself, his counsel or agent upon his Petition, if he think fit. A Petition of Feuars and other Inhabitants of the lands of Blythswood;-and, of Merchants, Bankers, Traders and other Inhabitants of the city of Glasgow,-were presented, and read; taking notice of the Bill for extending the Royalty of the City of Glasgow over the Lands of Blythswood and adjacent Lands, and for amending the Acts relating to the Police of the said City; and praying, That the same may pass into a law. A Petition of Thomas Rutherford, Deacon of the Flesher Incorporation of Perth, was presented, and read; taking notice of the Bill for enlarging, improving and maintaining the Port and Harbour of Perth; for improving the Navigation of the River Tay to the said City; and for other purposes therewith connected; and praying, That he may be heard by his counsel or agent against certain parts thereof. A Petition of Farmers, Merchants, Flax-spinners, Manufacturers and others, Inhabitants of Cupar and the surrounding country, was presented, and read; taking notice of the Bill for more effectually maintaining the Ferries and Passages across the River Tay, in the Counties of Fife and Forfar; and praying, That the same may not pass into a law as it now stands. 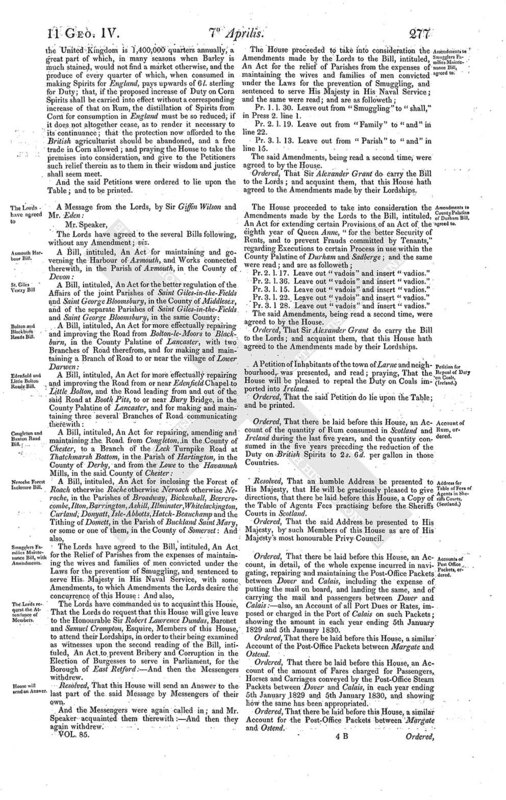 Ordered, That the Minutes of the Committee on the Petition of several Owners and Occupiers of estates within the counties of Warwick, Stafford, Salop, Buckingham and Middlesex, and Merchants, Manufacturers and other Inhabitants of towns and other places situate within the said counties, for leave to bring in a Bill for making a Canal from the Stratford-on-Avon Canal Navigation, within the Parish of Tamworth, in the County of Warwick, to the Oxford Canal Navigation, within the Liberty of Coombe, in the same County; and on the Petitions respecting non-compliance with the Standing Orders, be laid before this House. A Petition of Archibald Paterson, in Tradeston, of Glasgow, was presented, and read; taking notice of the Bill for making and maintaining a Railway from the Lands of Polloc and Govan to the River Clyde, at the Harbour of Broomielaw, in the County of Lanark, with a Branch to communicate therefrom; and praying, That the same may not pass into a law as it now stands. A Petition of Owners, Occupiers and Farmers of lands and tenements, Stage-coach Proprietors, Public Carriers and other Inhabitants of Cottingham, in the county of York, the town of Kingston-upon-Hull, and the towns and villages in the vicinity of the same parish and town, was presented, and read; taking notice of the Bill for maintaining the Roads from the Town of Kingston-uponHull, in the County of the same Town, to the Town of Beverley, in the East Riding of the County of York, and from Newland Bridge to the West end of the Town of Cottingham, in the same Riding; and praying, That they may be heard by their counsel against certain parts thereof. Ordered, That the said Petition be referred to the Committee on the Bill; and that the Petitioners be heard by their counsel upon their Petition, if they think fit. An ingrossed Bill for making a Turnpike Road from the Bridge over the River Bure at Great Yarmouth to Acle, with certain Branches therefrom, all in the County of Norfolk, was read the third time. Ordered, That Mr. Wodehouse do carry the Bill to the Lords, and desire their concurrence. Mr. Spring Rice reported from the Committee on the Bill for improving and repairing the Road leading from Newcastle, in the County of Limerick, to the City of Limerick, and from thence to Charleville, in the County of Cork; That the Standing Orders relative to Turnpike Bills, had been complied with; and that they had examined the allegations of the Bill, and found the same to be true; and had gone through the Bill, and made several Amendments thereunto; and the Amendments were read, and agreed to by the House. A Petition of Owners of Inns and Victualling-houses situate in the town and immediate neighbourhood of Wigan;-of Licensed Victuallers of the said town and neighbourhood;-and, of Brewers, Innkeepers and Publicans of the city, bail and close of Lincoln,-were presented, and read; setting forth, That the Petitioners have recently learnt that it is the intention of Parliament to repeal the Duties on Beer, to take away from the Magistrates the power of licensing common Inns and Victualling-houses, and to permit all persons indiscriminately to retail Beer, and that the Petitioners view such intention with feelings of great anxiety and alarm; and praying, That the House will not permit the proposed measure to pass into a law; but if Parliament should deem it expedient to do so, then the Petitioners pray that their interests and engagements may receive the serious consideration of the House, and that such relief may be granted to them as Parliament may think fit. A Petition of Farmers of the county of West Lothian, was presented, and read; setting forth, That the Petitioners have learnt with regret that various applications have been made to the Lords Commissioners of His Majesty's Treasury, with a view of inducing them to lend their countenance and approbation to a measure for raising the Duty on Spirits manufactured in Scotland; such a measure appears to the Petitioners to be fraught with injurious consequences to that part of the Kingdom, and to be in no way calculated to benefit the revenue; and praying the House not to impose any additional Duty on Spirits manufactured in Scotland. 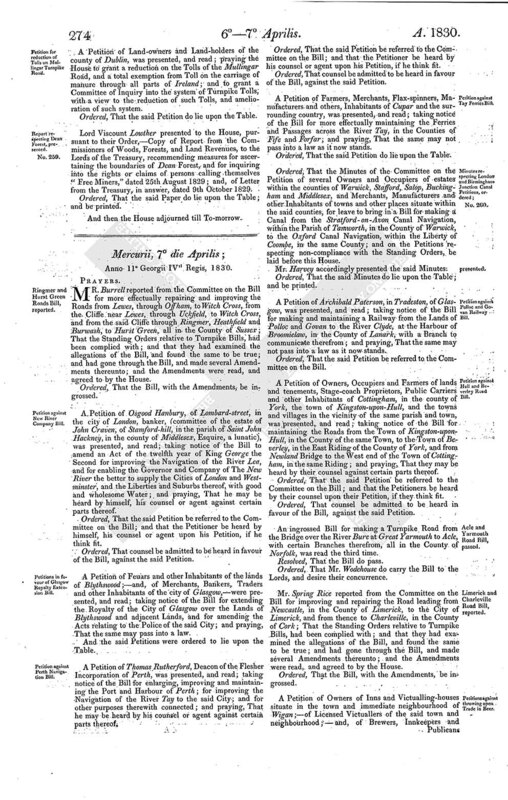 A Petition of Commissioners for the better regulating, improving and managing the town of Brighthelmston, and the poor thereof, was presented, and read; taking notice of the Bill to make Provision for the lighting, watching, cleansing and paving of Parishes in England and Wales; and praying, That the same may not pass into a law as it now stands. Ordered, That there be laid before this House, a Return of the number of Persons committed to the custody of the Marshal of the King's Bench Prison, to whom the privilege of the Rules has been granted, during each of the last five years, ending 1st January 1830, showing, in columns, the number of such Prisoners whose debts were under the sums of £.100, £.200, £.300, £.400, £.500 and £.1,000, and exceeding £.1,000 respectively; stating the amount paid in each year by each of the above class of Debtors, on account of such privilege being granted, by what authority, and by whom received, and how applied. Ordered, That there be laid before this House, a Return of the number of Prisoners for debt in the said Marshal's custody on 1st January 1830, who have been confined above one, two, three, four, five, six, seven, eight, nine, and ten years respectively. Ordered, That there be laid before this House, similar Returns from the Warden of the Fleet Prison. A Petition of several of the Operative Stonemasons of London and Westminster, was presented, and read; setting forth, That the Petitioners humbly show, that for several years past they have been descending into a state of suffering, from want of employment, which they have long borne with fortitude and resignation, in the hope of a general revival of trade, which they had been taught to expect from so many years of peace; that they are of opinion that overwhelming taxation, affecting every necessary article of consumption, has been, in a great measure, the cause of their present distress; and praying the House, as a means of present relief from their sufferings, greatly to reduce the taxes which press so heavily upon the industrious and labouring classes, and to protect them in future from falling into a similar state of distress; and that the House will take the earliest opportunity of passing such a law as will secure to the people a full, free and effectual Reform in Parliament. A Petition of Nobility, Gentry, Clergy, and Freeholders of the county of Hertford, was also presented, and read; setting forth, That the Petitioners, in the discharge of a constitutional duty at this time of general privation and suffering, beg leave most respectfully to express to the House the extreme distress under which every class of the community is labouring; that the Petitioners look up to the wisdom of the House for the mode of relief from evils unexampled in their nature, and unprecedented in their extent; that, free from all factious motives, and animated by an ardent spirit of loyalty and unabated attachment to the institutions of their country, the Petitioners deeply regret to learn, that an erroneous statement of the extent and pressure of their calamities has reached the Throne; that the Petitioners, convinced, as they are, that the interests of all are inseparably connected, view with infinite sorrow the increasing difficulties of the agricultural population immediately extending to every order of society; that, from actual experience, the Petitioners find the demand for the various productions of industry lessened, the means of future cultivation decreased, the value of labour depreciated, a frightful increase of pauperism, and a state of general wretchedness, which presses with accumulated weight upon a majority of their fellow-subjects of the middle and lower classes, who are reduced, in many instances, to parochial relief for their support upon the lowest possible scale of subsistence; that, anxious to relieve their condition, the Petitioners venture most respectfully to suggest to the House, that the remission of the Malt and Beer Duties would afford sensible relief to the lower classes, confident, as the Petitioners are, that the principles of justice will ever be maintained by the Legislature of the country, that faith will be preserved inviolate with the public creditor, and that any encroachment on the legitimate rights and properties of any class of His Majesty's subjects will never form part of any plan of relief from national embarrassment; that the Petitioners believe that the distress extends alike to the manufacturing and maritime interests, and they cannot forbear to remark, that its origin and increase correspond in point of time with the relaxation of our ancient Commercial Laws, under which this great Empire rose and flourished, and the abandonment of which is followed by its decline and decay, aggravated by the transition from one species of currency to another, and the consequent destruction of that credit which is essential to the prosperity of this great mercantile community; that the Petitioners feel assured that the continuance of the present calamities will tend to unsettle the minds of men, and render them less sensible of the blessings of our Laws and institutions, when oppressed by such misery as now exists; that it is with satisfaction the Petitioners have learned, that a system of just economy will be pursued, consistent with the honour, the best interests, and security of the Empire, and they venture to express an earnest hope, that the surplus arising from the diminished expenditure may be employed in relieving the public burthens, by a remission of those taxes which weigh most heavily on the lower classes, without which, the Petitioners humbly think, that such diminution would rather increase than lessen their difficulties; that the Petitioners further trust, that the House will adopt such measures as may tend to re-establish the commercial credit and confidence of the country under wholesome regulations, without which they fear that all measures of relief will prove ineffectual and insufficient. An ingrossed Bill for inclosing and exonerating from Tithes, Lands in the Parish of Caxton, in the County of Cambridge, was read the third time; and an ingrossed Clause was added by way of rider, and an Amendment was made to the Bill. Ordered, That Lord Francis Osborne do carry the Bill to the Lords, and desire their concurrence. Mr. Spring Rice presented a Bill for regulating and incorporating a Company in Ireland, to be called "The Irish Graziers Steam Marine Company:" And the same was read the first time; and ordered to be read a second time. Ordered, That the Churchwardens and Overseers of the Poor of every Parish, Township or other Place, in England and Wales, do prepare an Account, showing the total amount of Money levied for Poor Rates and County Rates, in the year ending on the 25th March 1830, upon such Parish, Township or other Place maintaining its own Poor; and also, the total amount of Money expended in that year, distinguishing in the said Account the amount of Money paid for any other purpose than the Relief of the Poor; and that such Churchwardens and Overseers do, as soon as may be, transmit such Account to the Clerk of the House of Commons, stating, in addition to such Account, whether any Select Vestry has been formed, or an Assistant Overseer appointed, by virtue of the Act 59 Geo. 3, c. 12; and any other observations which may be thought necessary. A Petition of Inhabitants of the Clothing District of Shipley, in the county of York, was presented, and read; praying, That the trade between this country, China and the interior of India may be completely opened to the enterprise, skill and industry of all British subjects, without distinction or reservation. A Petition of Merchants composing the Corporation of the Chamber of Commerce of the city of Waterford, was presented, and read; praying, That the House will not pass into a law a measure so opposed to commercial enterprise and social improvement as they conceive would be the proposed Bill for assimilating the Stamp Duties of Ireland to those of England. Ordered, That Sir Hugh Innes have leave of absence for a month, on urgent private business. Ordered, That Mr. Balfour have leave of absence for a month, on urgent private business. A Petition of the Chamber of Commerce of the city of Limerick, was presented, and read; praying the House to grant them relief, by repealing the Duty on Coals imported, as well as protection, by preventing the extension of the Stamp Duties to Ireland. A Petition of Owners and Occupiers of land in the neighbourhood of Burford, in the county of Oxford, was presented, and read; setting forth, That the Petitioners have, for many years past, experienced great and continued losses in the depreciation of their capital and profits, from the culture of their land; that they attribute those losses to a combination of events, over which they had no personal or direct control, and therefore the Petitioners merit every consideration; that they conceive the late changes of the corn laws and currency to have been chiefly instrumental to their injury; but as it appears meet to the House that no alteration should take place, they humbly pray that every possible compensation may be afforded them for those disadvantages, by creating, so much as can be done, an increased consumption and demand of their general produce; that the Petitioners believe taxation to be a certain means of limiting consumption in every article; but they are aware that the mode of laying it on is equally important with the amount of taxes imposed, in occasioning that effect, they think the present Duties on Malt and Beer to be especially objectionable, in the mode as well as amount of impost, and pray that the several Acts may be revised; and they also pray a total abrogation of those duties which materially obstruct a proper and extensive manufacture of the articles subject to them, if consistent with the preservation of the revenue, which they would consent to uphold even by a tax upon their property, being convinced that a perfect freedom in all the home trade is necessary to enlarge and preserve consumption and demand, and is requisite for the welfare of the country; that to augment this trade, and consumption of Malt, Beer and Barley, one of the principal products of the Petitioners, and for the sake of supplying the Public with better beverage, by means of competition amongst retailers, they lastly, pray that the licensing system may be altered, and a general liberty given to sell spirits and beer, without applying to the magistracy, and on merely taking out an excise license, as is now the case with respect to the sale of other exciseable articles. A Petition of Inhabitants of Chipping Norton and its vicinity;-and, of Kelvedon and its vicinity,-were presented, and read; setting forth, That the Petitioners having learned that the Penal Statutes relating to Forgery are likely to come under the consideration of the House, pray the House to direct its serious consideration to this most important subject, and to render the law in this respect more accordant with the humane feelings and enlightened views of the British Public. A Petition of Ralph Barchard Hankin, of the town of Bedford, Gentleman, was presented, and read; setting forth, That the Petitioner has for a series of ten years last past observed, in common with a great portion of His Majesty's most dutiful and loyal subjects, the formal use of the Law of Deodands, which the present enlightened age has considered almost obsolete, but which still retains its nominal place among the proceedings of coroners on inquisitions post mortem; that the Petitioner has viewed with satisfaction, in common with His Majesty's subjects, the doing away with all forms from legal proceedings founded on pious and superstitious usages, handed down from the dark ages of superstition, particularly what was formerly called "Benefit of Clergy;" and praying the House will take the matter into their consideration, and, if they see advisable, recommend to His Majesty the total abrogation of the Law of Deodands, or to enact such laws on the subject, with the advice of His Majesty, as to them shall seem meet. A Petition of Distillers in Scotland of Corn Spirits sent to England for consumption there;-and, of Distillers in Ireland of Corn Spirits sent to England for consumption there,-were presented, and read; setting forth, That, after much inquiry and consideration, a few years ago the Duty on Rum was fixed at 8s. 6d. per imperial gallon, and the Duty on Corn Spirits for home consumption was at the same time made 7 s. per imperial gallon in England, and on the faith of the arrangement then made by Government, after due inquiry into the state of the Rum and Corn Spirit trades, and ratified by Parliament, large capitals have been necessarily vested by the Distillers to adapt their premises to the regulations then introduced, which will become a dead loss, if, as proposed, the Duty on Corn Spirits shall be made 8s. per imperial gallon in England; that there has since been a great increase in the consumption of Rum is unquestionable, the increase upon the consumption now, as compared to the consumption of 1826, being about 50 per cent. ; but though there has also been an increase in the amount of gallons brought to charge of home-made Spirits consumed in England to the amount of about 64 per cent., yet this increase is to be ascribed in a great measure to the suppression of smuggling; that, if an additional Duty shall be laid upon home-made Spirit, unless a corresponding addition shall be made to the Duty on Rum, the latter will drive home-made Spirit out of the market, to the destruction of the Distiller, and, through him, to the great injury of the agriculturist; that, if it shall be deemed fit to increase the Duty on Corn Spirit, justice to the Grower of Grain and the Corn Distiller requires that there should be an additional Duty on Rum; that if the Home Distillers worked, as the maker of Rum does, without being subject to Excise regulations, and had unlimited access to every market for his raw material, and if no Duty were paid upon any part of it, the Home Distiller would be enabled to enter into competition with the maker of Rum; but in the situation in which the Legislature has thought fit to place him, both with respect to regulations which enhance the cost, and with regard to his Corn and the Duty laid upon it, and also upon his Malt, he humbly conceives that the Legislature is also bound to give him a protection in consequence of that situation; that consequence may be estimated when it is stated, that the quantity of Grain used in the distilleries of the United Kingdom is 1,400,000 quarters annually, a great part of which, in many seasons when Barley is much stained, would not find a market otherwise, and the produce of every quarter of which, when consumed in making Spirits for England, pays upwards of 6l. sterling for Duty; that, if the proposed increase of Duty on Corn Spirits shall be carried into effect without a corresponding increase of that on Rum, the distillation of Spirits from Corn for consumption in England must be so reduced, if it does not altogether cease, as to render it necessary to its continuance; that the protection now afforded to the British agriculturist should be abandoned, and a free trade in Corn allowed; and praying the House to take the premises into consideration, and give to the Petitioners such relief therein as to them in their wisdom and justice shall seem meet. The Lords have commanded us to acquaint this House, That the Lords do request that this House will give leave to the Honourable Sir Robert Lawrence Dundas, Baronet and Samuel Crompton, Esquire, Members of this House, to attend their Lordships, in order to their being examined as witnesses upon the second reading of the Bill, intituled, An Act to prevent Bribery and Corruption in the Election of Burgesses to serve in Parliament, for the Borough of East Retford:-And then the Messengers withdrew. Resolved, That this House will send an Answer to the last part of the said Message by Messengers of their own. Pr. 1. 1. 30. Leave out from "Smuggling" to "shall," in Press 2. line 1. Pr. 2. 1. 19. Leave out from "Family" to "and" in line 22. Pr. 3. 1. 13. Leave out from "Parish" to "and" in line 15. The said Amendments, being read a second time, were agreed to by the House. Ordered, That Sir Alexander Grant do carry the Bill to the Lords; and acquaint them, that this House hath agreed to the Amendments made by their Lordships. Pr. 2. 1. 17. Leave out "vadois" and insert "vadios." Pr. 2. 1. 36. Leave out "vadois" and insert "vadios." Pr. 3. 1. 15. Leave out "vadois" and insert "vadios." Pr. 3. 1. 22. Leave out "vadois" and insert "vadios." Pr. 3. 1. 28. Leave out "vadois" and insert "vadios." A Petition of Inhabitants of the town of Larne and neighbourhood, was presented, and read; praying, That the House will be pleased to repeal the Duty on Coals imported into Ireland. Ordered, That there be laid before this House, an Account of the quantity of Rum consumed in Scotland and Ireland during the last five years, and the quantity consumed in the five years preceding the reduction of the Duty on British Spirits to 2s. 6d. per gallon in those Countries. Resolved, That an humble Address be presented to His Majesty, that He will be graciously pleased to give directions, that there be laid before this House, a Copy of the Table of Agents Fees practising before the Sheriffs Courts in Scotland. Ordered, That there be laid before this House, an Account, in detail, of the whole expense incurred in navigating, repairing and maintaining the Post-Office Packets between Dover and Calais, including the expense of putting the mail on board, and landing the same, and of carrying the mail and passengers between Dover and Calais:-also, an Account of all Port Dues or Rates, imposed or charged in the Port of Calais on such Packets; showing the amount in each year ending 5th January 1829 and 5th January 1830. Ordered, That there be laid before this House, a similar Account of the Post-Office Packets between Margate and Ostend. Ordered, That there be laid before this House, an Account of the amount of Fares charged for Passengers, Horses and Carriages conveyed by the Post-Office Steam Packets between Dover and Calais, in each year ending 5th January 1829 and 5th January 1830, and showing how the same has been appropriated. Ordered, That there be laid before this House, a similar Account for the Post-Office Packets between Margate and Ostend. Ordered, That a Select Committee be appointed to inquire into the present state of the Library of the House of Commons, to consider respecting future regulations for the preservation and management thereof, and to report their Observations thereupon to the House:-And a Committee was appointed, of Mr. Agar Ellis, Mr. Bankes, Mr. Secretary Peel, Mr. Spring Rice, Lord Viscount Lowther, Lord Viscount Morpeth, Mr. Littleton, Mr. Cust, Mr. Ridley Colborne, Mr. George Dawson, Sir Robert Inglis, Sir Henry Hardinge, Mr. Williams Wynn, Sir George Clerk, Sir James Graham, Mr. Courtenay: And they are to meet To-morrow, in the Speaker's Chamber. Ordered, That leave be given to bring in a Bill to alter and amend an Act of the seventh and eighth years of His present Majesty, for consolidating and amending the Laws of Excise on Malt made in the United Kingdom, and for amending the Laws relating to Brewers in Ireland, and the Malt Allowance on Spirits in Scotland and Ireland: And that Mr. George Dawson and Mr. Chancellor of the Exchequer do prepare, and bring it in. Ordered, That the Order of the day, for the third reading of the ingrossed Bill for transferring certain Annuities of Four Pounds per Centum per Annum, into Annuities of Three Pounds and Ten Shillings, or Five Pounds per Centum per Annum, be now read; and the same being read:-The Bill was read the third time; and several ingrossed Clauses were added to the Bill, by way of riders. Ordered, That the Order of the day, for the House to resolve itself into a Committee of the whole House, to consider of the Act 56 Geo. 3, c. 56, to repeal the several Stamp Duties in Ireland, and also several Acts for the Collection and Management of the said Duties, and to grant new Stamp Duties in lieu thereof, and to make more effectual Regulations for collecting and managing the said Duties; and also, the Act 56 Geo. 3, c. 107, to amend an Act of the last Session of Parliament relating to Stamp Duties in Great Britain, so far as relates to Inventories to be exhibited and recorded in any Commissary Court in Scotland, be now read; and the same being read:-The House resolved itself into the Committee; and, after some time spent therein, Mr. Speaker resumed the Chair; and Sir Alexander Grant reported from the Committee, That they had come to a Resolution, which they had directed him to report to the House. Ordered, That the Order of the day, for the House to resolve itself into a Committee of the whole House, to consider of the Act 12 Charles 2, c. 34, for prohibiting the planting, setting, or sowing of Tobacco in England and Ireland; and also, the Act 22 Geo. 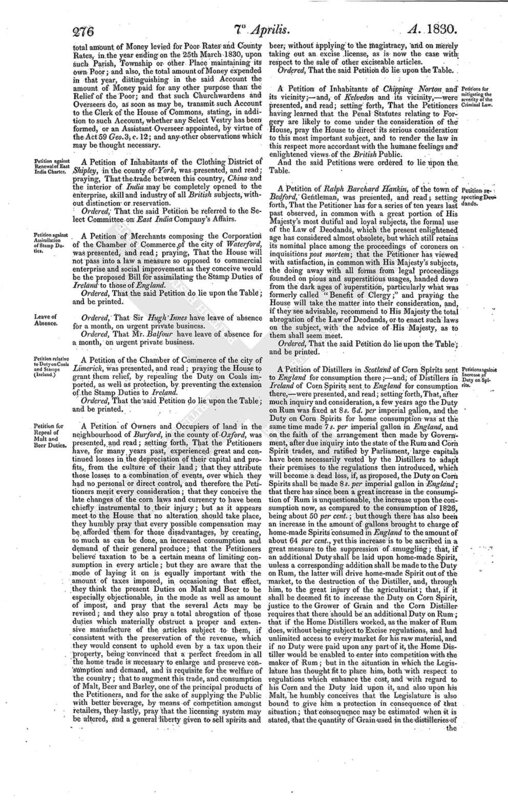 3, c. 73, to explain an Act made in the twelfth year of the reign of King Charles the Second, intituled, "An Act for prohibiting the planting, setting, or sowing of Tobacco in England or Ireland, and to permit the Use and Removal of Tobacco, the growth of Scotland, into England, for a limited time, under certain Restrictions, be now read; and the same being read:-The House resolved itself into the Committee; and, after some time spent therein, Mr. Speaker resumed the Chair; and Sir Alexander Grant reported from the Committee, That they had come to several Resolutions, which they had directed him to report to the House. 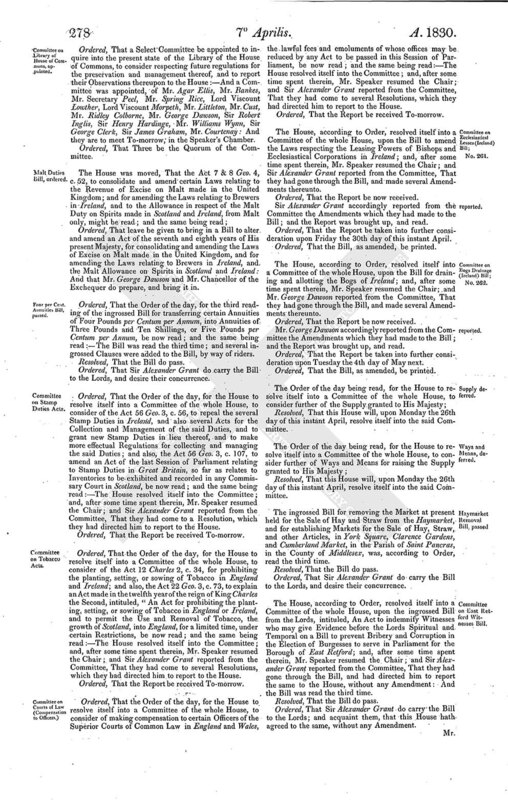 Ordered, That the Order of the day, for the House to resolve itself into a Committee of the whole House, to consider of making compensation to certain Officers of the Superior Courts of Common Law in England and Wales, the lawful fees and emoluments of whose offices may be reduced by any Act to be passed in this Session of Parliament, be now read; and the same being read:-The House resolved itself into the Committee; and, after some time spent therein, Mr. Speaker resumed the Chair; and Sir Alexander Grant reported from the Committee, That they had come to several Resolutions, which they had directed him to report to the House. The House, according to Order, resolved itself into a Committee of the whole House, upon the Bill to amend the Laws respecting the Leasing Powers of Bishops and Ecclesiastical Corporations in Ireland; and, after some time spent therein, Mr. Speaker resumed the Chair; and Sir Alexander Grant reported from the Committee, That they had gone through the Bill, and made several Amendments thereunto. Ordered, That the Report be now received. Sir Alexander Grant accordingly reported from the Committee the Amendments which they had made to the Bill; and the Report was brought up, and read. Ordered, That the Report be taken into further consideration upon Friday the 30th day of this instant April. Ordered, That the Bill, as amended, be printed. 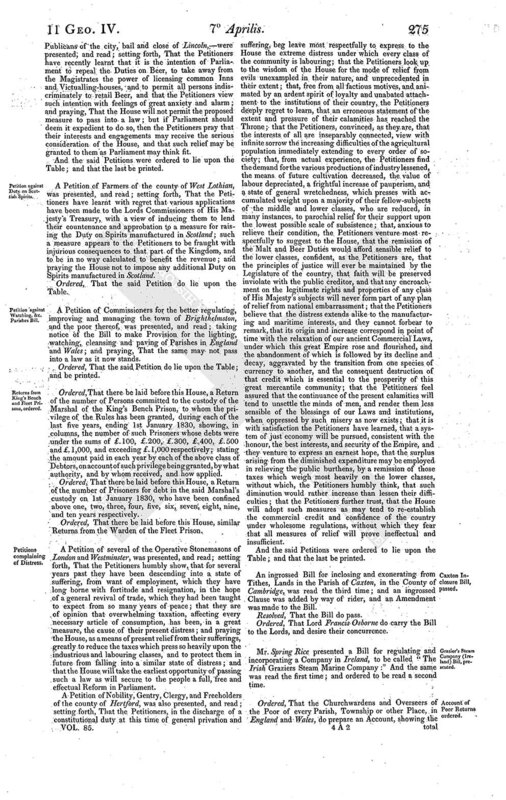 The House, according to Order, resolved itself into a Committee of the whole House, upon the Bill for draining and allotting the Bogs of Ireland; and, after some time spent therein, Mr. Speaker resumed the Chair; and Mr. George Dawson reported from the Committee, That they had gone through the Bill, and made several Amendments thereunto. Mr. George Dawson accordingly reported from the Committee the Amendments which they had made to the Bill; and the Report was brought up, and read. Ordered, That the Report be taken into further consideration upon Tuesday the 4th day of May next. Resolved, That this House will, upon Monday the 26th day of this instant April, resolve itself into the said Committee. The ingrossed Bill for removing the Market at present held for the Sale of Hay and Straw from the Haymarket, and for establishing Markets for the Sale of Hay, Straw, and other Articles, in York Square, Clarence Gardens, and Cumberland Market, in the Parish of Saint Pancras, in the County of Middlesex, was, according to Order, read the third time. The House, according to Order, resolved itself into a Committee of the whole House, upon the ingrossed Bill from the Lords, intituled, An Act to indemnify Witnesses who may give Evidence before the Lords Spiritual and Temporal on a Bill to prevent Bribery and Corruption in the Election of Burgesses to serve in Parliament for the Borough of East Retford; and, after some time spent therein, Mr. Speaker resumed the Chair; and Sir Alexander Grant reported from the Committee, That they had gone through the Bill, and had directed him to report the same to the House, without any Amendment: And the Bill was read the third time. Ordered, That Sir Alexander Grant do carry the Bill to the Lords; and acquaint them, that this House hath agreed to the same, without any Amendment. Mr. George Dawson presented a Bill to alter and amend an Act of the seventh and eighth years of His present Majesty for consolidating and amending the Laws of Excise on Malt made in the United Kingdom, and for amending the Laws relating to Brewers in Ireland, and the Malt Allowance on Spirits in Scotland and Ireland: And the same was read the first time; and ordered to be read a second time upon Monday, the 26th day of this instant April.